Hello again! Welcome to the Club Scrap Artist Team Challenge blog hop. You should have just come from Roni's blog along the hop. 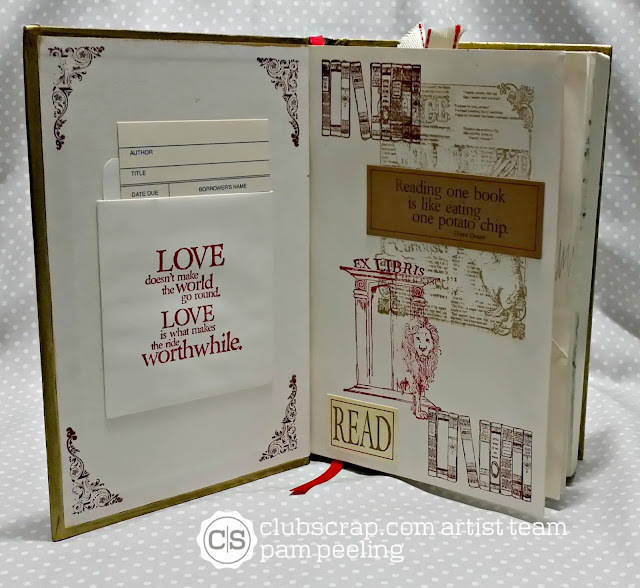 This month's kit at Club Scrap is called Literature. It has papers and images with a book and story theme. The Artist Team was challenged to make something you could give as a gift. I had a papercrafting retreat last weekend and the group I go with all gives each other a little giftie. Perfect timing! I made an altered book with a secret compartment inside! Well actually I made 4! I decided to leave the front fairly free of decoration as a real book would be-I didn't want it to look too altered until they opened it up and saw the "secret" compartment inside! 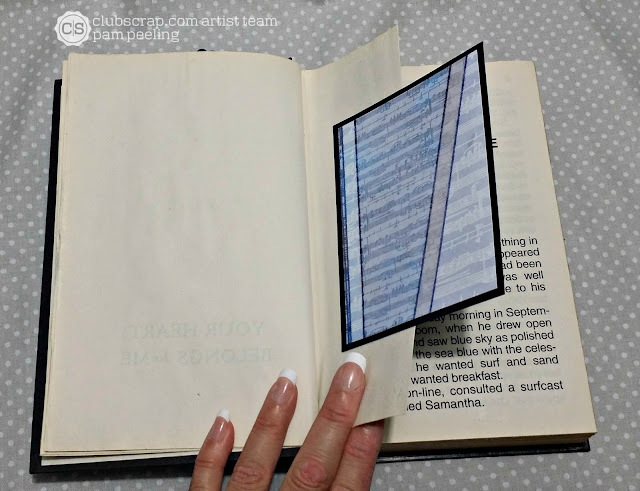 I found this great tutorial on how to make the compartment inside the book. The hardest part was cutting out all the pages for the compartment- trying to make the sides smooth and cutting the corners. My advice-definitely drill the corners! I didn't for my 1st attempt and it was really hard. When I did another book and drilled the corners it went so much easier! Also-use a NEW blade in your knife! I love those library cards! and holders. Soo cute! I made a little pocket by just folding over one page and gluing it to the next along the side and bottom. 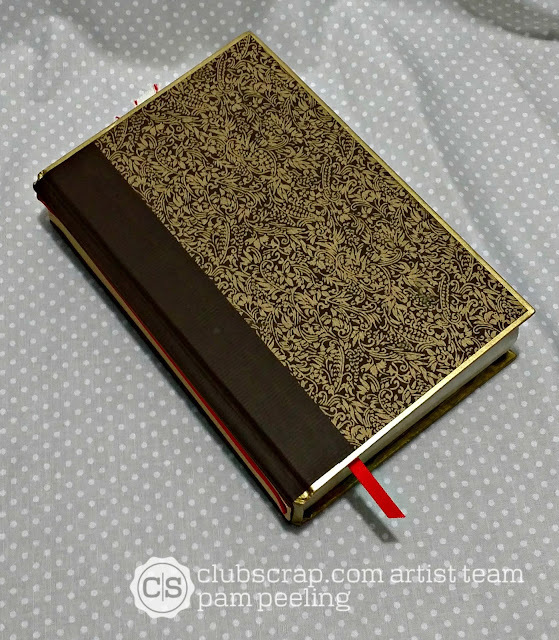 Then I made a tag that can be pulled out and journaled on or photos added. From the outside you'd have no idea it wasn't just a regular book! Then...BAM! You open it up and there's this cool little niche carved out! Aaahhh love it! I folded some pages in half and added a matte with printed paper-just for variety. I also left some blank pages so they can make it their own if they want to. I filled the compartment with candy to give to my retreat friends. 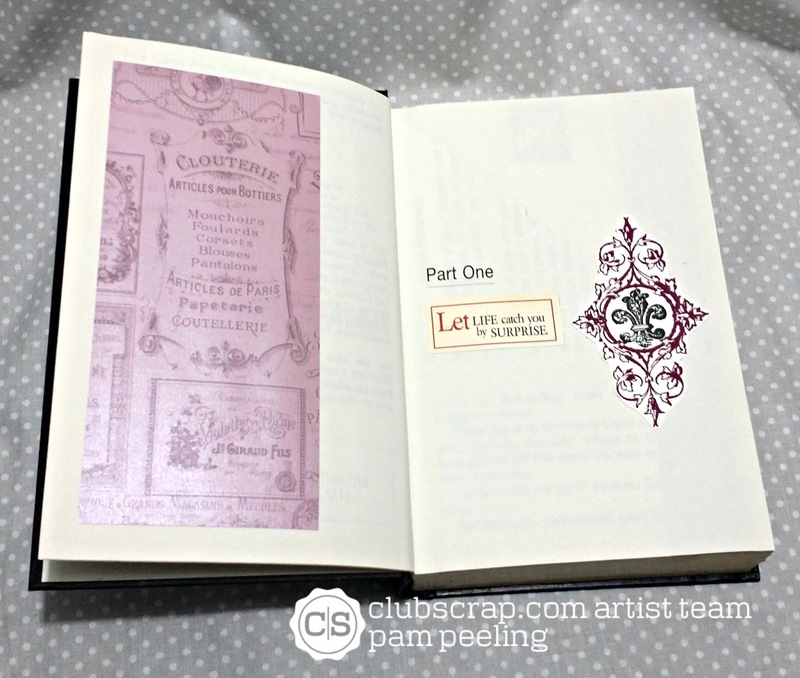 The next stop on the Artist Team Challenge blog hop is Hetty! Follow along to see what she made! 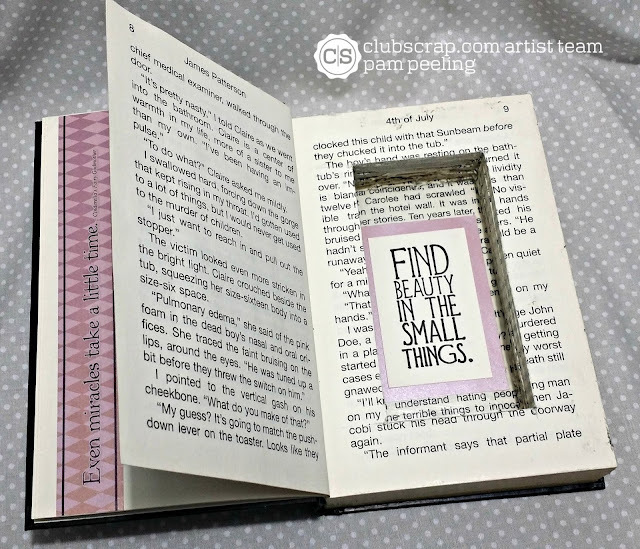 Altered books are so much fun to make!! 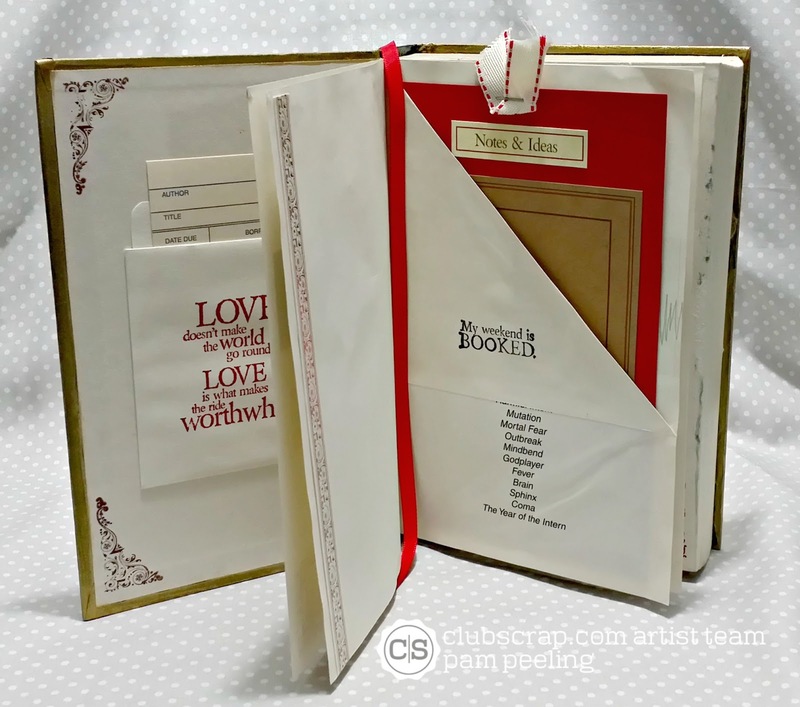 I love how the Literature kit works so well embellishing these lovely gifts!! OH wow what a great way to make a gift from a book! I love it! 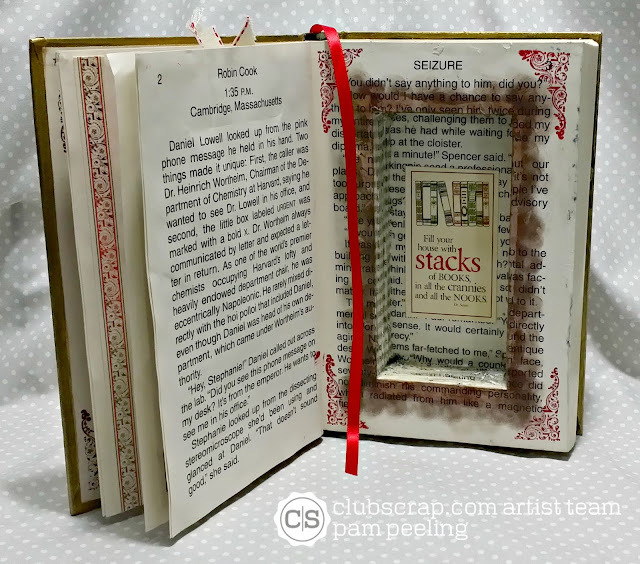 Terrific altered book. Candy in the secret spot inside is a great touch! Way to go girl! 4 at once! I'm impressed! Beautiful altered books! Great gift idea! Beautiful books and what gorgeous gifts! Oh this is soooo cool! They are beautiful! Gorgeous! What a neat way to recycle hard covered books. Love what you did! I have some so definitely on my to do list. Fun idea! Love your stamping on the inside cover of the Literature version. Julie Fei-Fan Balzer has a new show on PBS called Make It Artsy, and the 1st episode a few weeks ago was all about books. She had a guest who showed a great way to stabilize the pages with nails to hold them together while you're cutting out the center. Episodes are available online. I love books with lots of little pockets and secret places! What a fabulous secret treasure! Very brave to stamp on the inside cover! These are awesome! I bet the recipient LOVED hers!